The bankruptcy code provides two types of bankruptcy for consumer debt: Chapter 7 and Chapter 13. Chapter 7 is a liquidation bankruptcy where a trustee sells the debtor's assets and pays his debts until the money runs out. The bankruptcy court discharges the remaining debts. A Chapter 13 bankruptcy is a repayment bankruptcy where the debtor submits to a plan to use future income to pay off the debts. The debtor can't discharge domestic support obligations in either kind of bankruptcy. In a Chapter 7 bankruptcy the debtor can't discharge other divorce settlement obligations either but may be able to do so in a Chapter 13. Under both Chapter 7 and Chapter 13, you can't discharge domestic support obligations. Domestic support means money owed to support a spouse, former spouse, child or governmental unit. Alimony, spousal maintenance and child support are common terms used to describe domestic support obligations. The bankruptcy court has interpreted the definition to include payments in the nature of support, even when not paid directly to the beneficiary, including some counsel fee, life insurance, education and mortgage payments. The rules are the same whether you owe support under a divorce settlement, separation agreement, divorce decree, court order or administrative order. Under Chapter 13, domestic support obligations also must be kept current throughout the proceeding or the bankruptcy can be dismissed. If you owe money under a divorce settlement that is not domestic support, the court still won't discharge the debt in a Chapter 7 bankruptcy. But, this is not the case with a Chapter 13 bankruptcy. 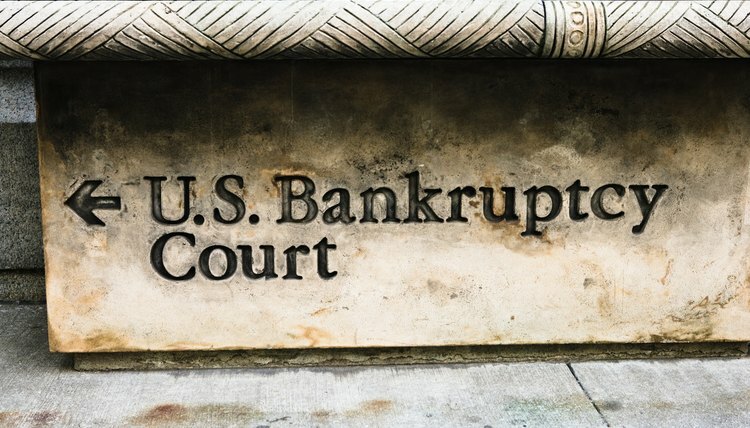 While the court won't discharge domestic support in a Chapter 13 bankruptcy, it has the authority to discharge other debt related to a marital settlement. To determine whether a debt qualifies as domestic support, the bankruptcy court considers the language in the settlement documents, the intent of the parties, the financial situations of the parties and the frequency and amount of the payments. In a divorce settlement, the parties often agree that one party will assume all responsibility for a joint debt. Under Chapter 7, the court can't discharge this obligation, so the other party is not affected by the bankruptcy. In a Chapter 13, if the court determines that the obligation is not in the nature of support, the debtor may be able to discharge all or part of the obligation. So, if you have a settlement agreement where your spouse is supposed to take the joint debt, you still can get stuck with it. If your spouse gets his responsibility for the debt discharged in a Chapter 13 bankruptcy, you are responsible for that debt, no matter what's written in the settlement agreement. A pension is a unique asset because the future payments are usually distributed through a Qualified Domestic Relations Order. The bankruptcy court has determined that the spouse's share is immediately transferred when the QDRO is issued, so that the debtor spouse no longer owns the asset when he files for bankruptcy after the divorce. The bankruptcy does not affect a pension distributed in this way, and the spouse who didn't go through the bankruptcy still will receive all the payments to which she is entitled to under the divorce settlement. Can You File Bankruptcy on Bills Obtained in a Divorce Settlement? If you file for bankruptcy protection from creditors, a federal court gains jurisdiction over your assets, debts and financial affairs. The court has the authority to eliminate dischargeable debts, liquidate your assets or set up a repayment schedule (as in a Chapter 13 bankruptcy filing). However, the court also has the authority to dismiss or terminate the case, either on your motion or on its own initiative.